Historically – traditional manufacturing methods for welded steel conveyor rollers have usually commenced by welding two empty pressed steel bearing housings onto the two opposing ends of the prepared roller tube. Thereafter a series of subsequent and multiple assembly operations complete the production process. With the introduction of the prefabricated bearing housing assembly (cartridge), this method is no longer used by either our UK or our overseas customers – who no longer regard the exclusive use of empty bearing housings, as best practice. Outlined below are a few explanatory comments on how this new technical development has significantly improved the welded steel roller manufacturing process. Unwanted harmonic vibration of the conveyor belt – of itself giving rise to further problems such as spillage, uneven belt wear. etc, etc. Uncontrolled bearing preload, bearing wear, bearing over-heating, etc. A combination of all these effects will either (worst case) cause the roller to fail very quickly, or (best case) will significantly shorten the working life of the roller. The introduction of the prefabricated bearing housing assembly (cartridge) and the way in which this development has affected the roller manufacturing process, has to a large degree minimised this problem, for the roller manufacturer. Traditionally – when commencing the roller assembly process, by welding the two empty pressed steel bearing housings onto the opposing ends of roller tube – the primary location method in terms of maintaining roller axial alignment, was controlled by two solid central tooling mandrels incorporated within two sets of welding assembly tooling. These two sets of tooling are mounted upon the two opposing heads of a conventional roller welding machine – each central mandrel working in conjunction with its own matching external tooling element – which is used for aligning the central axis of the roller tube. Such central mandrels have traditionally been designed to interface accurately with the empty pressed bores of the two steel housings – with the primary objective of aligning the two central axes of the housings with the central axis of the roller tube. With the introduction of the cartridge – this critical control point has now moved to the central axis of the roller shaft itself. The solid centre tooling mandrel has now been updated to incorporate a precision machined female socket – to accept the shaft over-projection protruding from the end faces of the pre-assembled and pre-greased roller. For roller manufacturers who are not already customers of Edwin Lowe Ltd – we must explain that the roller is already fully assembled and fully greased – before the welding cycle takes place. Therefore one can see that by definition – once manufacturers have adopted the new range of prefabricated bearing housing assemblies / cartridges to manufacture their range of rollers – their own manufacturing process will have significantly changed as a result. The roller manufacturer will have prepared the ends of the roller shaft very precisely – producing a shaft diameter, via machining or grinding, which is toleranced to a few microns, to match the bore / inside diameter of the required bearing – in order to produce the two bearing seats, at both ends of the roller shaft. Equally the hollow sockets within the two opposing central mandrels of the new design of welding machine head tooling, are very finely machined, in order to produce very precise inside diameters, which, in turn, are toleranced to a few microns, against the outside diameters of the two prepared ends of the roller shaft. In addition – the two central axes of the two opposing central mandrels are very precisely aligned with each other, around the central axis of the roller welding machine (lasers are now commonly used for this) when the welding machine is actually installed. The bearing housing cartridge has also been precisely engineered in terms of axial alignment – for example – tight flange concentricity and eccentricity tolerances, around the central axis of the component, are critical elements of the cartridge design. Therefore when the tooling mounted upon the two opposing heads of the twin headed roller welding machine clamps all components in place upon the machine – prior to the welding sequence – the closely toleranced inside diameters of the two central mandrels interfacing with the closely toleranced outside diameters of the shaft projections – automatically ensures that all roller components are automatically aligned with the central axis of the roller shaft. i.e. The two opposing sets of external head tooling have automatically aligned the central axis of the roller tube to the central axis of the roller welding machine –while at the same time the female centre tooling has automatically aligned the central axis of the roller shaft and therefore the central axes of the two roller bearings also – with the central axis of the roller welding machine. Therefore one can now say that for the very first time – the process of aligning of all the central axes of all the constituent components, within the roller, is not only automatic – but more importantly – automatically more precisely controlled – compared with previous assembly methods. In other words the welding machine assembly operation is now the final assembly operation within the much shortened roller manufacturing process – automatically ensuring that all of the central axes of all the roller components – i.e. shaft, bearings, tube are all automatically brought into line with the central axis of the welding machine itself. This has not solved all of the roller manufacturer’s problems – i.e. 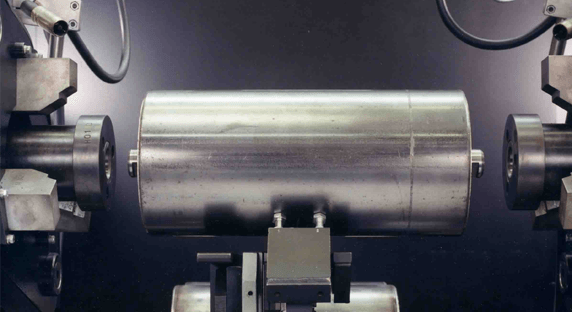 we are still left with the commercial tolerances of the roller tube manufacturer, with regard to straightness, ovality, wall thickness, etc – and with tight control of shop floor machining tolerances, etc – but we can say that a lot of the ‘guesswork’ has now been removed from the question of roller axial alignment, for the roller manufacturer. 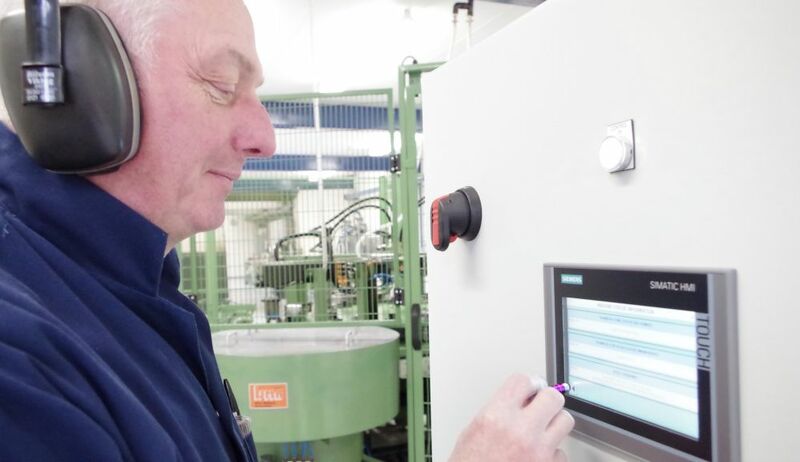 In turn, this can only help with regard to repeatability of quality and with the speeding up of the manufacturing process – with the additional beneficial effect of reducing the overhead unit cost of each roller produced. This also means that housing bore dimensions / tolerances and the housing flange diameter dimension / tolerances are no longer of primary importance, for location purposes, during the welding process. By locating via the central axis of the roller shaft – the distance between the flange outside diameter of the cartridge and either the inside diameter of the machined recess within the end of the tube – or alternatively of the outside diameter of the faced ends of roller tube itself – has been averaged. The weld bead completely fills this space during the welding cycle – irrespective of precise placement of the flange outside diameter against the end of the roller tube.